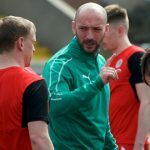 Chris Curran acknowledges Cliftonville have had to get their bodies and minds in gear for tonight’s Europa League Play-Off Semi Final with Ballymena United as they bid to bounce back from Saturday’s Irish Cup Final disappointment. 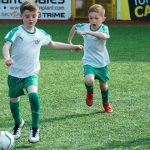 The Reds’ 3-1 defeat to Coleraine means involvement in a four-team shoot-out for the Danske Bank Premiership’s last remaining European berth and Curran insists he and his team mates are hungry to get back to winning ways against the Sky Blues. “The process of getting ready for that started as soon as Saturday’s game ended,” he says. 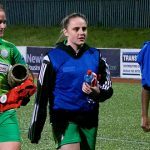 “We haven’t had too long to dwell on the defeat, it’s a massive week for the Club and we have to get straight back at it and try to put the weekend behind us because it’s gone now. 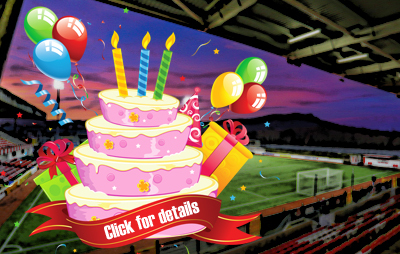 You can read the full Curran interview in this evening’s edition of our Matchday Magazine, which will be on sale at Solitude for £2.50. 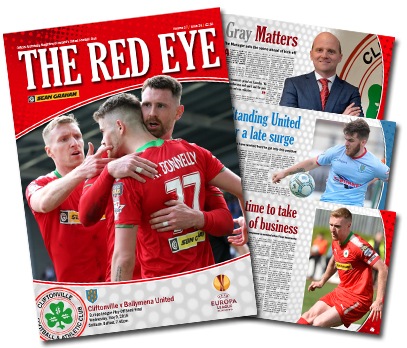 In addition to boss Barry Gray’s pre-match views, The Red Eye’s 26th issue of the season also carries a chat with goalkeeper Declan Dunne and catches up with new boy Ryan Curran, as well as taking our traditional steps down memory lane – plus plenty more besides.